Seems like every time I have turned on our Television this week there are ads for New Year's Resolution. LA Fitness really wants our business. If you look at statistics New Year's resolutions rarely stick because we may bite off more than we can chew or give up as soon as we have one setback. Often, this is also the case when trying new things with instruction. Maybe you had a bad experience with a digital formative assessment or maybe you were frustrated when you were about to do an assignment with the chromebooks and students were not able to access it because their computers were not charged. Here is an interesting article from Forbe's Magazine that says instead of writing a New Year's resolution take time to reflect on the last year and ask questions like when was I inspired? When did life change last year? Where do I want to be this time next year? I think we can also take this and apply it to the classroom. When were my students the most inspired? Did my curriculum change? What fell flat that I want to revamp? When you start connecting those dots you may be inspired to make adjustments for this year. For example, maybe you want a resolution for students to be more collaborative. Here are some great resources from FlipGrid that have already done much of the heavy lifting for you. They have also recently created this Educator Innovation Station where you can get ideas and support and help. Maybe you just need a spark or an idea to get going. 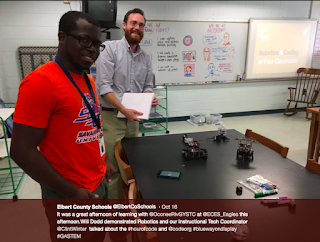 Check out the Elbert County Instructional Technology took kit to see a tool that may be best for you. I You can filter these tools to find the one you are looking for. One of my all time favorites is from a site on this page called classtools.net there you can find Twister. This is what got me sparked going a few years back. Twister is where students can create Tweets from famous people in history. I hope that you have a great start to the 2nd half of the school year. If you have questions about any of this please let me know.